The advance GDP estimates shocked even the most pessimistic India-watchers. It is likely there will be an upwards revision. However, even a big positive revision is still likely to peg GDP growth in 2012-13 at well below 6 per cent, which makes it the worst performance since 2002-03, when growth bottomed at 4.3 per cent. Given a 2012-13 growth rate at well below expectation, there is now little confidence in a large rebound in 2013-14. Yet, only a rapid growth acceleration can contain the Fiscal Deficit, and the Current Account Deficit. The other theoretical solution - lower government spending - is unrealistic in election year. There are several other disturbing data points. First, take a look at GDP growth rates since 2007-08, when India registered 9 per cent and a third successive year of above 8 per cent growth. This was despite the global crisis breaking out in the latter half of the fiscal. Since then, India has seen GDP rates of 7.4 per cent (2008-09), 8 per cent (2009-10), 8.4 per cent (2010-11), 6.2 per cent in 2011-12 and let's say, somewhere between 5-5.5 percent in the current fiscal. Quarter by quarter, India has seen growth recession since Q3, 2010-11 (Oct-Dec 2010). Among other indicators, inflation has a CAGR of 7 per cent over the past 68 months. The WPI moved from 114.5 in April 2007 to 168.5 in December 2012. The slope of the WPI time-series has been steady since February 2009 (WPI 123.3) with an inflation CAGR of 8.5 per cent in the 46 months ending December 2012. That is 3.5 per cent above the “targeted” 5 per cent inflation rate for the past four years. 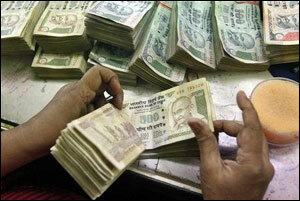 The domestic savings rate is also expected to drop to a decadal low of 30 per cent in 2012-13. It peaked in 2007-08 at around 37 per cent and fell to an eight-year low of 30.8 per cent in 2011-12. This erosion is partly because financial assets have given poor returns since 2007-08. Given external obligations and the Current Account Deficit, India has to attract inflows of at least $80 billion in 2013-14 to avoid reserve depletion. FDI amounted to about $25 billion between April-November 2012, while FII inflows amounted to about $26 billion in the 12 months ending Jan 2012. In 2011-12, India attracted a record $46.8 billion of FDI. So net FDI+FII inflows of $80 billion in a given fiscal will be quite a stretch. Reserve depletion is likely. Given massive deficits, high inflation, external pressures and reserve depletion, currency weakness is also likely. None of this looks good. The best one can hope for is that the cycle has indeed bottomed out and growth will rebound sharply in 2013-14. This could still happen if the RBI cuts rates and there is resolute fiscal policy action that revives the appetite for investment. While the macro-economic situation has deteriorated, corporate earnings growth has also slowed down. Yet, the stock market had an excellent year in 2012-13. Markets tend to anticipate future events and this is often cited as an explanation for apparent disconnects between balance sheet numbers and shareprices travelling in opposite directions. Markets can get things wrong. In fact, they frequently do. Sometimes the market anticipates changes in the business cycle that don't in fact, occur. Sometimes it fails to identify real reversal points. Even when it does anticipate a reversal correctly, there is no way to accurately predict how much of a lead or lag there will be. Markets can also continue to get it wrong for long periods. This is okay if share prices are under-valued since an investor can just wait. But it creates a real problem for the investor when prices are over-valued and he must either invest at level which he considers expensive. Or he must wait on the sidelines and risk missing a big rally. The silver lining may be that things are now bad enough for the political establishment to act. The economy could rebound with surprising speed if the right policy decisions are taken and implemented quickly. One thing is clear. The RBI will be under huge pressure to continue with rate cuts. On that basis alone, there could be a big jump in earning growth.